Le·gal In·sur·rec·tion: Does This Mean My House Never Will Be Waterfront? I really didn't care when they revoked the claim that the glaciers would disappear. I don't live near glaciers. The paper – entitled "Constraints on future sea-level rise from past sea-level change" – used fossil coral data and temperature records derived from ice-core measurements to reconstruct how sea level has fluctuated with temperature since the peak of the last ice age, and to project how it would rise with warming over the next few decades. Question: Can "scientists" accurately correlate a tree ring measurement in, say, millimeters with a temperature of hundredths, or even tenths, of a degree Centigrade? Question: Can they precisely differentiate the portion of tree ring width resulting from more rain versus warmer temperatures? would like to know these two mistakes. My suspicion is that it revolves around the ice caps. Most of them are floating in the water. ice takes up 14% more space then the equivalent liquid water, however when ice floats 90% is submerged and increases water volume, while ten % is above water affecting air volume. When it becomes totally liquid the over all mass of the entire liquid water rejoins the ocean resulting in a net LOSS of 4% volume. Ocean levels would fall not rise. unless all the glacial melting and mountain ice caps offset this 4% by 4% or more the ocean level would drop in the event of melted ice caps. See? That's why we can't have an intelligent discussion. It's always about facts and logic with you guys. AGW studies may be fake but they are accurate! The debate among political scientists (you know, your classmates in college who didn't know what they wanted to do when they grow up) has been over for years already! Troubling lack of reading comprehension for a law professor. The retraction was of an estimated *limit* to sea level rise. 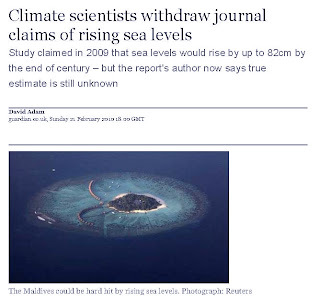 The retraction was because they didn't know if their original estimate was too high or too low: "Siddall said that he did not know whether the retracted paper's estimate of sea level rise was an overestimate or an underestimate." And if they don't know whether their estimates were correct, they don't know the lower limit. The retraction was actually caused by... climate scientists who showed that this estimate was almost certainly too low. They're the same scientists mentioned in the article. The retraction of the article is in reality a further sign that the IPCC estimates mentioned in the article are far too low. This is in keeping with satellite data showing that rising sea levels have consistently been at the upper bounds of IPCC projections. Don't worry, it looks like you'll still get your waterfront property (at least for a while...). The title of the paper should have warned you - "Constraints of future sea level rise..." - Other scientists have succeeded in persuading them that their 82cm by 2100 constraint is almost certainly wrong and a better prediction is about double that. How far above sea level did you say your property was? Now they won't need that department. Nothing is going to happen except Goldman and Sachs won't make money in the carbon credit market and neither will Al Gore.